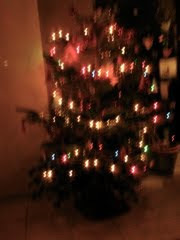 We have put up our Christmas tree. 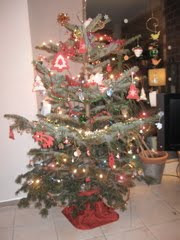 It is a jumble of tinsel, tiny wooden figures and felt trees, and now thanks to Nikolaus, Kinder chocolate Santas. Just the way we like it. Nikolaus, Sinterklaas, Saint Nicolas, Kleesche, the model for Santa Claus and a beloved figure in our area (Northeastern France, Germany, Benelux countries) is celebrated on December 6. The night before, children put their shoes out for him to fill with sweets, chocolates, little presents as well as something for him to drink and nibble on, and some snack for his donkey. I must say I don't relate so much to this tradition but I like to embrace it as it makes the children happy. In Luxemburg, Kleesche is often accompanied by his dark friend Houseka, whom we call Père Fouettard in French, who is supposed to come and spank/club naughty children. He certainly frightens smaller children but since his threats never come true, his educational value is low, ha ha. 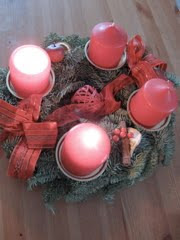 Today is also the second Sunday of Advent so we have lit the second candle on our wreath. The marzipan cake (picture below, left) I was talking about last time was finished last Sunday. It was quite good. 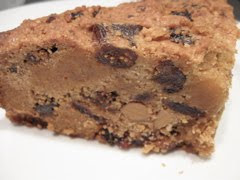 A few days ago I made a Dundee cake following this recipe. I'm a big fan of Dan Lepard, he bakes and photographs superbly. We sliced it open yesterday and to my surprise, it was quite soft-crumbed and a little too sweet. But fear not, it shall be eaten too. Today I felt inspired to prepare for the inevitable gift-giving of the next weeks. I have cut up Nigella's brownies and frozen them, I have made her peanut butter squares and something called Berliner Brot from this book, which is a very chewy, chocolate-hazelnut cinnamony type of cookie. 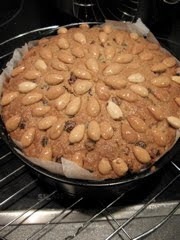 It's not very pretty so I'll spare you a picture (think brown square with crackly top and hazelnuts inside). 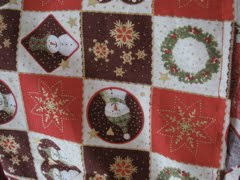 The piece of Christmassy fabric I bought in Paris last week was turned into a tablecloth. I am also working on a little shoulder bag inspired by Melissa's beautiful creations. I wonder how it'll turn out since I have made up the pattern and have probably cut everything too small. 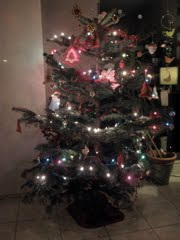 Happy Saint-Nicolas /Second Advent/ Sunday to you!